Sheltered under the covered pavilion, the MetroParks Ice Rink sets the scene as a perfect winter wonderland in downtown Dayton. Patrons may skate daily, including all holidays. While the rink is open, you can enjoy delicious treats from the concession area, including a cup of hot chocolate. Take advantage of fun skating activities, such as lessons, themed skating nights and more. 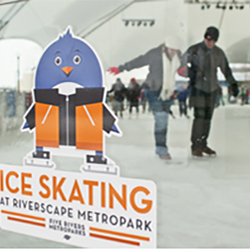 Visit metroparks.org/ice-rink to learn more, find daily open hours, and see a schedule of events. Admission: $5 daily, ice skate rental: $2 daily. Ages 3 and under are free with a paying adult. 278-2607.